www.SurgeryToday.com (209) 551-1888. Calvin Lee, MD. Surgical Artistry. Modesto, CA. 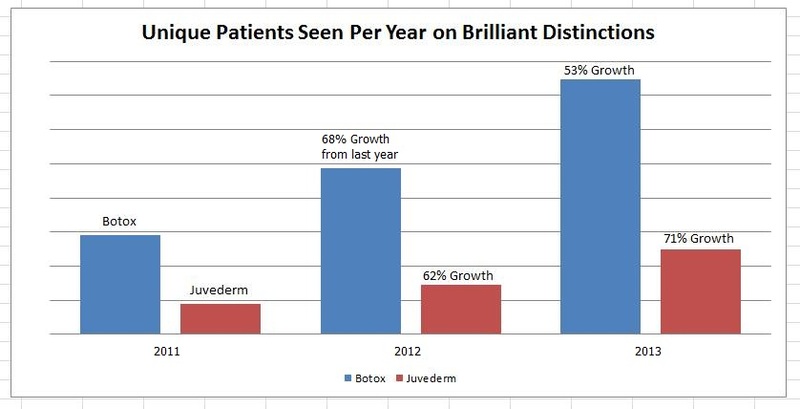 The 60% growth of Botox and Juvederm (and Latisse too) mentioned in the title refers to the growth of new patients. This does not reflect the growth in sales or profits, just purely the number of people our Modesto, CA practice has shared the usage of Botox, Juvederm and Latisse. Thank you for trusting me as your injector. This shows a nice increase of about 60% new patients per year. Data from our 635 patients enrolled in Botox/Juvederm’s Frequent Flyer Program called Brilliant Distinctions and our statistics since we started participating in the program in 2011. Unique patients means that if a patient came four times a year, that patient is only counted as one Botox visit or one Juvederm visit (not 4). The growth rate here of 68% for a year in 2012 and 53% for a year in 2013 for our Modesto Botox injection is just a growth rate of new patients coming to our practice. It doesn’t reflect the growth rate of the amount of Botox used. That would be another study. Juvederm on the other had had a 62% growth rate for Juvederm in 2012 and 71% growth rate in 2013. The full “year” was counted from August 15-August 14 of the following year. We’ll see what 2014 brings. Comparison to Latisse growth rate in terms of number of unique patients per year. In 2012 and 2013, the total number of unique patients using Latisse is almost exactly the same as our number of Juvederm Patients. Juvederm before and after picture for cheeks | Botox in Modesto Blog by Calvin Lee, MD on Belotero and Botox for around the eyes. Botox Blog web page is for informational purposes only. For specific medical and plastic surgical advice, please visit your doctor in person or visit us in person in Modesto, CA. Dr. Calvin Lee & Dr. Tammy Wu.